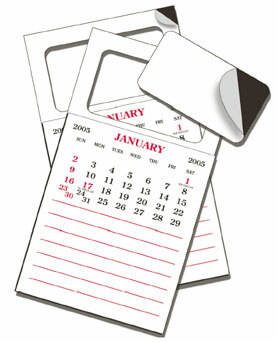 Our economical wholesale peel-off magnetic calendar pad with room for your notes is also known as peel & stick magnetic calendar notepad. The twelve month 3 1/2" x 4 1/4" calendar is printed in black and standard red and attached to a magnetic business card backer with peel off liner. This magnetic business card calendar is two magnets in one! Punch out the center portion of the magnetic backer and attach your business card to the frame to create a personalized tear-off calendar. Then peel the liner from the center magnet and create a second personalized magnet by attaching your business card. Lowest prices in the USA and Canada for peel & stick magnetic calendars. American clients pay no taxes.